Fall is sweater season! In addition to wearing sweaters, fall is a great time to break out the coats. A nice coat is an essential part of any wardrobe. A cute sweater keeps you warm, but nothing blocks out the chill in the air like a good coat. Pick up one of our beautiful coats made of twill or fleece. Warm and durable, jackets made from these materials will last for years. 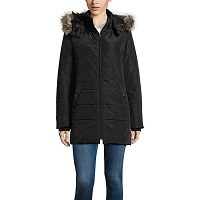 JCPenney has a great selection of women's jackets for fall including long jackets and cropped styles. Chances are you've already discovered you have a favorite brand of coat, and our collection has coats from many major labels. 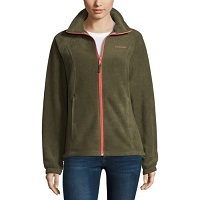 Find women's Nike jackets, Arizona jackets, and colorful Columbia jackets in styles you'll love. Look for a sporty Nike zip-up jacket for a trim look or try out a Columbia rain jacket to keep the weather at bay. These brand-name numbers are quality performance wear. They will suit your active life and keep you in style at the same time, without breaking the bank. Black is a true wardrobe staple, and there is nothing like a classic black jacket for fall. Look for a wool pea coat with stylish buttons. A trench coat never goes out of style, and black is always in fashion. An anorak is a perfect fall style choice, and a black jean jacket goes with everything. Pair a simple black jean jacket with a sweater dress and boots for a hip look. Check out our selection of jackets and coats in basic black and you'll find that they are anything but basic. For any style of jacket you are looking for, we've got it in black. Celebrate the season of pumpkins and pumpkin spice by wearing the colors of the season. Don't limit yourself to coffee shades. Look for jackets in warm golden tones including red, burgundy, orange, and rust. Fall is a colorful season, so update your look by wearing a bright jacket, and you just might outshine the fall colors and rich fall sunsets. Women's Columbia rain jackets come in so many colors that a rainy day will never make you feel blue. Jean jackets, hoodies, and anoraks can be found in soft colors or go for a bold look with a bright fleece jacket in rich shades. Fall fashion revolves around wearing warmer clothing, and jackets are an easy option to slip on or take off as the weather changes. 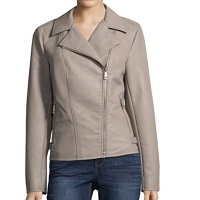 JCPenney has a collection of cool women's denim jackets and cooler faux leather jackets that are both warm and stylish. Look for faux leather zippered jackets in rich hues or pair a cropped jean jacket with a plaid shirt to pull your modern fall look together. 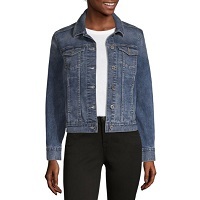 Wear a blended jean jacket with soft jersey knit sleeves and a hood to keep cozy and trendy. Summer may be ending, but we say bring on fall, and give me that gorgeous coat!